Win a $50 Gift Certificate to Morton’s The Steakhouse! Congratulations to Sarah Johnson on winning our ninety seventh High Five Giveaway! Thanks to all who entered. 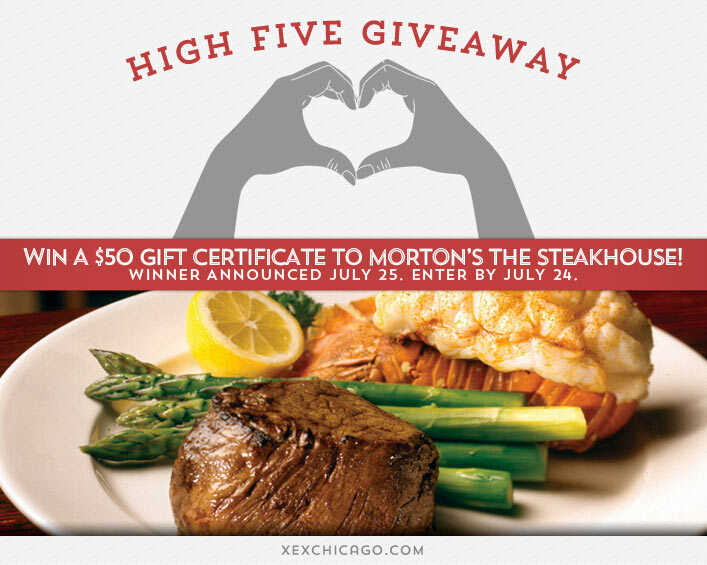 For our next High Five Giveaway we have a $50 gift certificate to Morton’s The Steakhouse. Morton’s The Steakhouse at Wacker Place is located at the epicenter of some of Downtown Chicago’s most celebrated attractions and downtown hotels. Walking distance from the Magnificent Mile, Millennium Park and the Chicago Theatre District, this steakhouse offers a superb dining location for a business power lunch, after work drinks and small plate $5 Bar Bites, an exceptional dinner or even over 4,000 square feet of private dining space in six private dining rooms. Morton’s The Steakhouse is located at 65 E Wacker Place, Chicago. Visit their website at www.mortons.com or call them at 312.658.0305 for more information. What is the name of the Aveda styling foam that works well with fine hair? Now, just add a comment to this post with the right answer to be eligible to win! The winner will be announced on Friday, July 25. Enter by midnight on Thursday, July 24. Aveda’s Phomellient Styling Foam…I love this product for my fine hair! Aveda’s Phomellient Styling Foam is what works well for fine hair !